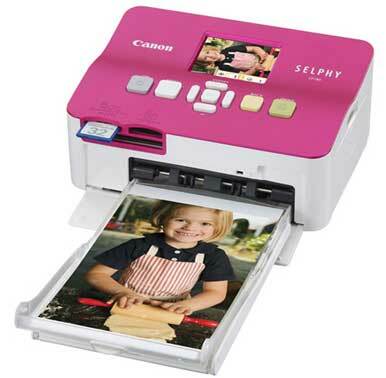 Canon’s Selphy CP780 snapshot printer has its problems—namely, mediocre speed and expensive, wasteful consumables. But it’s affordable and its design is simple, making it a good choice for light home use. Aimed at the family market, the compact Selphy CP780 comes in three colors (blue, pink, or silver) and can function with or without a computer. A 2.5-inch color LCD and oversize, intuitively labeled control buttons take you through simple editing and special-effects options. The Selphy CP780’s features include three front media slots for CompactFlash, SD Card, MultiMediaCard, and Memory Stick, plus a PictBridge port on the left side. To use xD-Picture Card and other formats, you’ll need a third-party adapter. A Bluetooth adapter costs $50; a rechargeable battery pack costs $80. The front-loading paper cassette holds up to 54 sheets of 4-by-8-inch photo paper. To print on 4-by-6-inch photo paper, you must manually push the stack of paper to the front of the tray. The cassette’s double-lid design is confusing: You have to lift both lids to load paper, but just one to insert the cassette into the printer. An optional, business-card-size cassette costs $13. Blame the CP780’s drawbacks (it slowness, its wastefulness) on its dye-sublimation printing technology. It creates images by transferring successive layers of cyan, magenta, and yellow dye from a roll of film onto photo paper, finishing with a clear-coat layer. Once a photo is printed, that section of film cannot be reused, regardless of how much dye is left, resulting in a lot of waste. Photos cost a pricey 33 cents each. And because completing a single photo requires four passes, the Selphy CP780 prints slowly, taking about 75 seconds on average (0.8 pages per minute) to finish a 4-by-6-inch snapshot. Photo quality varies for the Selphy CP780. Photos of people and objects were a little light-colored but reasonably detailed. On the other hand, a mountain landscape appeared pale and unrealistic, like a bad 1950s postcard. The included software is for Windows only. The Selphy CP780 is an inexpensive and nearly idiot-proof snapshot printer, but you make major compromises in performance and price per page.